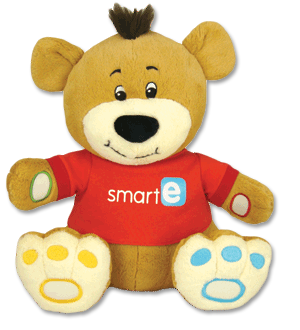 smart-e-bear is a huggable, loveable friend that plays award-winning kids music, fun games, and interactive stories right out of the box! Download thousands more educational and fun songs and stories from our online store. And personalize him to call your child by name or even speak Spanish, French, or Chinese! With smart-e-software, it’s as easy as Connect, Click, Cuddle. GOT A SMART-E? GET SMART-E-SOFTWARE!